Looking to elevate your small business's videoconferencing game? Microsoft might have just the thing. The software giant on Tuesday released Skype Meetings, a free tool aimed at small businesses offering real-time audio and HD video conferencing. 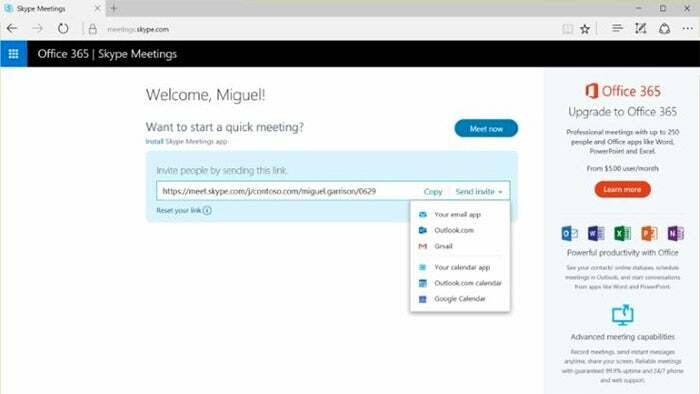 The tool is available to anyone in the US with a business email address whose organization doesn't already have an Office 365 subscription that includes Skype for Business, which is more full-featured that this new free tool. With Skype Meetings, you can set up calls for up to 10 people for the first 60 days. After that, your calls will be limited to just three people. Microsoft is, of course, just giving users a taste of the videoconferencing features available as part of Skype for Business, which lets you hold online meetings for up to 250 people. The free tool offers some of the same features, such as the ability to instant message other participants during a meeting, but Skype for Business takes this a step further, letting you IM anyone in your organization whenever you want, not just during meetings. Meanwhile, Skype Meetings does have some other handy features, including the ability to share your screen or a PowerPoint presentation with other participants, and use a virtual laser pointer and whiteboard. Meeting organizers will also get some "professional meeting controls," like the ability to mute the audience so everyone pays attention to just you. To get started, all you need is an Internet browser, a microphone, speaker, and camera. Head here to start a meeting. For a look at Skype Meetings in action, check out the video below. Also be sure to check out PCMag's full review of Skype for Business.